Newcastle boss Rafael Benitez has tipped Chelsea to be among the sides challenging for the Premier League title come the end of the season. The Spaniard’s side host the Blues at St James’ Park on Sunday and is wary of the quality they possess. Indeed Benitez – who won the Europa League as Chelsea boss in 2013 – sees Maurizio Sarri’s men as one of three favourites for the crown. “Maybe at the moment, there are three teams that you could say that they are a little bit ahead of the others, for me – Chelsea, Liverpool and Manchester City – because of the level, the performances last year and the money they spent,” he said. Benitez and Sarri have history, with the latter succeeding the former on the Napoli bench in 2015. It was under the Italian that the Naples outfit re-established themselves as a top-three force in Serie A, and the Newcastle boss praised his achievements. “We did what we had to do. He did well, played good football and they had a very good group of players,” he said. 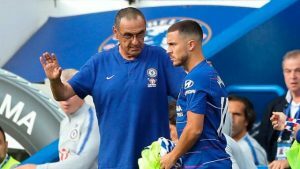 Sarri has started life in the Stamford Bridge dugout in impressive form, leading the Blues to victories against Arsenal and Huddersfield Town.